My daughter has an annual pass to the Universal Studios theme park in Orlando. A group of the passholders are having a Christmas party, and she asked me to make a unique card for her to attach to the gift she's taking for their Chinese gift exchange. She wanted it to include as many of the characters represented at the park as I could. So, using some computer images and some Kindred Stamps characters, I created this card for her. The inside was made using Karen Burniston's Twist Panel Pop-Up die and includes quite a few characters. I hope she (and the recipient) like this personalized card. 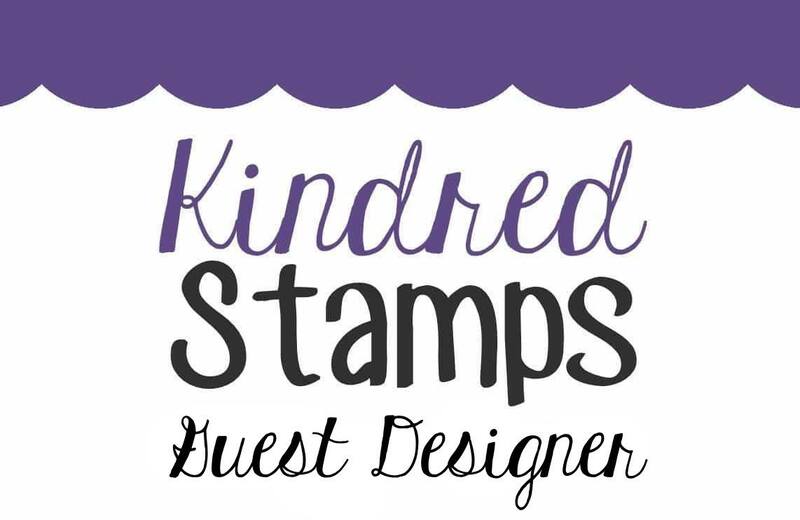 Anne winds up her month as hostess for the CCEE Stampers with a relatively simple challenge -- make a card using at least one circle and one square. As Christmas is right around the corner, I made a Christmas card using some Heartfelt Creations patterned paper. 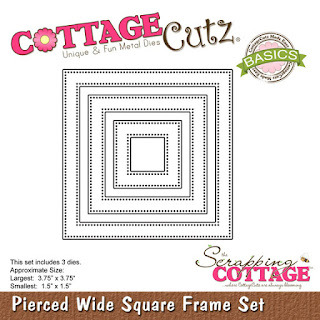 Stop over at the CCEE Stampers blog for some more cards with circles and squares. My favorite challenge on Splitcoaststampers has always been the Saturday Inspiration Challenge. Today's inspiration website was Caspari, a site filled with all kinds of wonderful things for Christmas. This Nativity 3D Advent Calendar was my inspiration today. 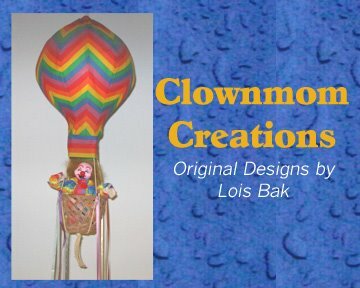 I used several different media to create my card. The front is a relatively simple design, featuring some gorgeous patterned paper I found in Hobby Lobby earlier in the week. It is called Stargazing from The Paper Studio. I used one of the designs for my background and just stamped an image and a sentiment on top. The "inspiration" was developed on the inside, where I combined several different die sets to create my Nativity scene. The pop-up portion and the stable in the background are part of the Karen Burniston House and Fence Pop-Up die set. 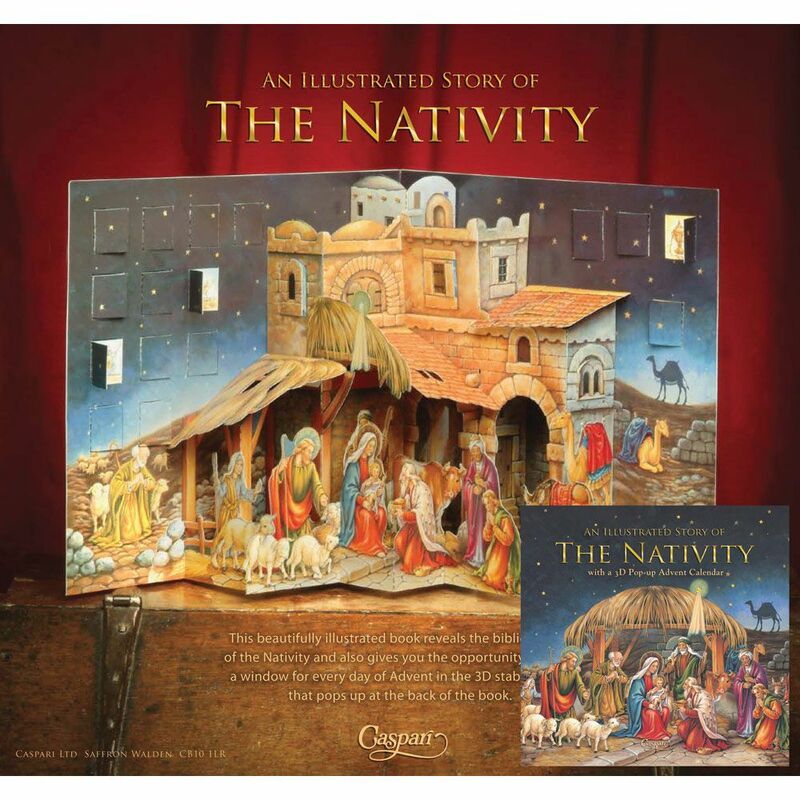 The figures are from two different CottageCutz dies, Nativity - Mary, Angel and Baby and Nativity - Joseph, Shepherd and Animals. Before I cut the "stable," I glued a piece of woodgrain patterned paper onto the brown cardstock I used. I also added a section to either side of the stable to extend the sides over to the edge of the floating floor, as you can see here. I didn't want the fence to look like a wrought-iron fence; so, after I cut it from brown cardstock, I trimmed the fence posts, taking off the pointed tops. Here again is my version of my inspiration piece. 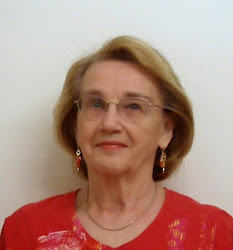 Anne continues as hostess of the CCEE Stampers this week and tells us that today is her daughter's birthday. She says that Amy (her daughter) loves to get funny cards and challenges us to make a birthday card -- extra points if it's humorous. Art Impressions makes some really humorous stamp sets, so I pulled out their Spring Chicken set and made this card. The inside says something that is close to what my feelings are about growing older. 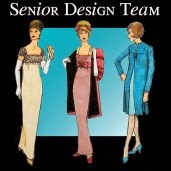 I've always said, "Getting old is not for sissies," but you get the idea! Stop over at the CCEE Stampers blog to see some more birthday cards -- humorous or otherwise. It's hard to believe that Thanksgiving is this week -- and with that comes Christmas right around the corner. 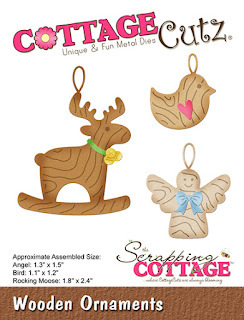 I'm still making Christmas cards, and that's what I have for you today -- using one of the dies from the CottageCutz Christmas release as well as a couple of older dies. As you may know, I love making fun fold cards -- today's is an easel card. To start my card, I cut all the die pieces from white cardstock. I lightly sponged the glass candle holder pieces with Ranger Distress Tumbled Glass ink. The rest of the pieces were colored using Copic markers. When they were all colored, I assembled my candle holder. I then cut the cardstock and patterned paper for my card. Patterned paper - 3 1/2" x 3 1/2"
The large red piece of cardstock was scored at 2 1/8" and 4 1/4". After folding on the score lines, I placed some Scor-Tape on the first 2 1/8" x 4 1/4" panel. This is where the square panel will be attached. I then adhered the patterned paper to the square red panel and attached it to the folded base. I placed foam tape on the back of the frame and the candle holder . . .
. . . and attached them to the card front. At this point I decided I wanted to add another element to the card, so I cut some additional pieces from the die, colored and constructed a small sprig of foliage, and attached it to the upper left-hand corner of the frame. With an easel card, you need something to act as a "bumper" to hold the easel erect. I often use a sentiment to do that. I cut "celebrate" five times from red cardstock. After gluing the die-cut pieces together, I placed the sentiment on the under panel on which I had placed a 4" square of patterned paper. The word "celebrate" is high enough to hold the card open for display. Several months ago I made a Halloween castle card, using the Karen Burniston Castle Pop-Up die. I thought I would give a Christmas castle a try. I've got tons of Christmas paper, so the hardest part was deciding which patterned paper to use on my card. I finally decided and put my card together. The front includes a Santa and sleigh flying across the top. That's an Impression Obsession die. In addition to the Karen Burniston Castle Pop-Up set, I also used some wreaths from both the House & Fence die set and the Sleigh die set. I carried the same theme into the inside of my card, adding the fence from the House & Fence die as well. I took some close-up photos so that you can see the castle in more detail. Anne reminded the CCEE Stampers that the November birthstone is Topaz and asked us to make a card using the colors in the yellow to amber range. My card is definitely yellow! I used the Karen Burniston Cupcake Pop-Up die for this card. 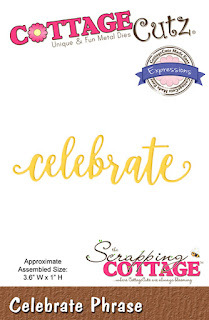 Be sure to check out the CCEE Stampers blog to see how many shades of yellow are represented in today's challenge. I'm a big fan of the Harry Potter universe, having read all seven books (several times) and seen all eight movies (multiple times as well). The latest addition to the Potter world is the Fantastic Beasts series. The second movie in this series is being released this week. I have made a card to commemorate the occasion, using several stamp sets and the fun Karen Burniston Twist Panel die. The front of the card was made with stamps from MFP Stamp Shop, which unfortunately is no longer in business. The soda cup was made with a CottageCutz die, Pumpkin Pie and Latte. The inside shows some of the characters from the movie, mounted on the Karen Burniston Twist Panel. The stamps are from a Kindred Stamps set called Catcher of Beasts. I am definitely looking forward to the movie! Today's card went together relatively quickly. I used one of the new CottageCutz Christmas dies, Wooden Ornaments, and some pine patterned paper, and the card sort of put itself together. To start my card, I cut the die pieces from scraps that I had on my scrap pile -- the three ornaments from some tan cardstock and the accessories pieces from a scrap of white. I sponged some Vintage Photo distress ink onto the ornaments and colored the accessory pieces with Copic markers, then constructed the three ornaments. Cream - 5 1/2" x 8 1/2", scored at 4 1/4"
Red - 5 1/4" x 4"
Patterned paper - 5 1/8" x 3 7/8"
I then cut the Christmas sentiment from scraps of both red and white cardstock and constructed my card base, forming a sort of shadow behind the sentiment. Using the pine sprigs for reference, I added the ornaments -- cutting a small section out of the hangers to make it appear that the loops went behind the sprigs. The loops are glued down flat, but the ornaments are popped up on foam dots. As I said before, the card went together relatively quickly. I love that! 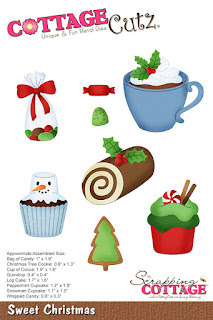 Anne continues as hostess for the CCEE stampers again this week, and she tells us that today is Tongue Twister Day. She says, " Most languages have their own versions of tongue twisters. In sign language, they are called 'finger fumbles'. 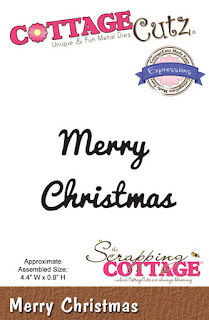 Use a tongue twister to inspire your card." My card is based on the old favorite, She Sells Sea Shells by the Sea Shore. 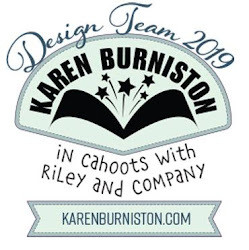 I used several Karen Burniston dies on my card. 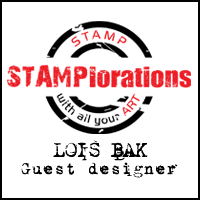 Stop over at the CCEE Stampers blog to see how many tongue twisters are represented in today's challenge. Who doesn't love cookies and cocoa? That's exactly what I've got for you today! My card was made with several new Christmas dies from CottageCutz as well as an old one. 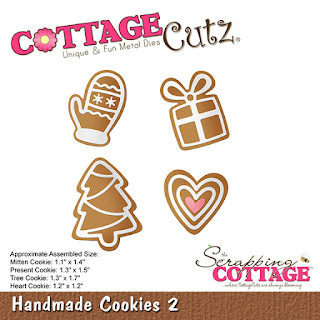 To start my card I cut the cookie images from some cream-colored cardstock using CottageCutz Homemade Cookies 1 and 2. Using some Ranger Distress ink (Tea Dye and Vintage Photo) I colored the cookies and topped them with the icing pieces, which I did not color -- except for the two hearts. 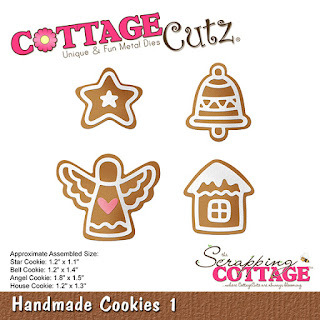 After they were all constructed, they looked just like gingerbread cookies! 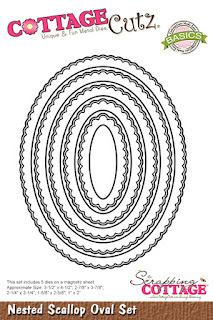 To make the plate on which to serve the cookies, I cut two ovals (one in cream and one in green) using the 2nd largest Nested Stitched Scallop Oval . . .
. . . cutting the center out of the green oval and adhering it to the outside of the cream one. I then placed the cookies onto the plate, gluing some of them down flat and popping some up with foam adhesive circles. 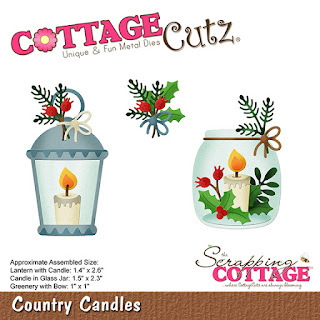 I cut the cup, cocoa, marshmallow and holly from the CottageCutz Sweet Christmas die . . .
. . . sponging the "cocoa" with Tea Dye distress ink and coloring the holly/berries with Copic markers. Plaid patterned paper - 5 1/8" x 3 7/8"
It was then just a matter of constructing the card base, adding the cookie plate and cup of cocoa. I then stamped an appropriate sentiment and punched it out, attaching it at the top -- and my card was complete.